Ingrid Fox is a Helen Cutter figure with the hair turned ginger and the eyes painted green. Thadius Torchwood was an Editor figure with a coat from a 10th Doctor. 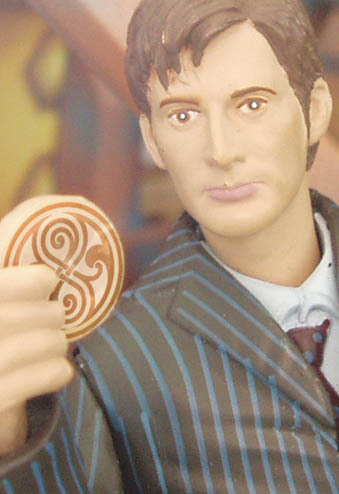 Part four sees a flashback using the original 3.75" figure and that of the 8th Doctor. 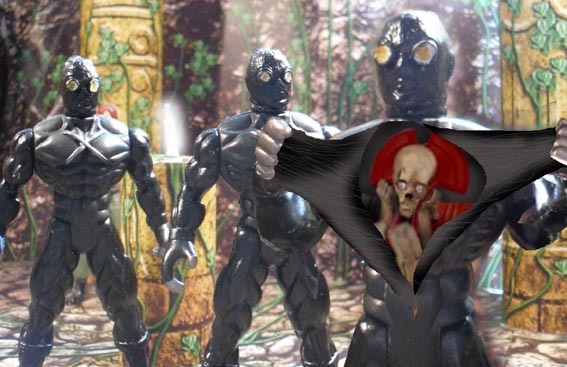 The Chronoghast is a Pit Witch figure from Army of Darkness heavily photoshopped. GODMAKER was put out on the web in five consecutive days from Monday 23rd to Friday 27th November. The original story was supposed to be transmitted from July- November 2009 ahead of the 10th Doctor's finale on TV at Christmas. With the first episode about to be posted, the first and second Doctor figures were released along with news of further classic figures on the way. In all the 'classics' excitement, it didn't seem the right time to launch a 'new series' adventure so it was held over, initially for a week. But after a week and with further thought, it seemed more appropriate to hold the story over for transmission in one block in November and make a real event of it, as befits the end of an era. I considered doing it as Flash movies. I was worried though that with the prospect of extra work, the project might not get finished. The Doctor is summoned to Firetrap by Ingird Fox to rescue Sarah Jane. But Ingrid has a trick up her sleeve- a Time Lord seal. The seal bears the name Daedelus. The Doctor recalls an ancient apocalypse cult of Daedelus that fled Gallifrey. On a decaying ship, they bump into Torchwood who is also following the trail and who brings news of an alien cult worshipping the Time Lord Daedelus. Fleeing the derelict and the chronoghasts, the Doctor and his companions discover a hidden planet and receive a recorded message apparently from a Time Lord. Using Torchwood's vortex manipulator the Doctor and Torchwood arrive randomly on a Dalek ship heading for a space station in the Silver Devestation (the remains of Gallifrey) Here the Daleks meet with their ally Daedelus- the plan, to create a new race of Dalek Time Lords. Torchwood is cornered by Daleks and forced to escape using his manipulator while the Doctor faces off against Daedelus but is unable to stop the stellar device being sent towards the sun. The Doctor chases it in the TARDIS but Deadelus uses the device to power the TARDIS down. The Doctor can only watch through the doors as the manipulator destroys the sun and sends the energy to the space station where it will create a new Eye of Harmony. Torchwood returns just in time with an alien armada that destroys the Dalek ships. But the Eye of Harmony is created and Ingrid steps inside becoming a Time Lord. The fight kicks off with Daedelus during which Ingrid helps the Doctor by destroying the Eye. But both she and Daedelus are pulled into the destruction. The plan for this story goes back a long time. When Ingrid Fox was first created as an enemy for Sarah Jane we came up with the climax of the Sarah Jane Adventures with Sarah Jane and Ingrid transported into space. Seeking a resolution to this it became obvious that the Doctor would be involved. With the tenth Doctor on his way out, I started to think about how I would wrap up not just his time but also the Russell T Davies era. What was the ultimate thing that the 10th Doctor could do? The answer I came up with was to restore the Time Lords, albeit temporarily, so as not to step on the toes of the TV series. With a second wave of classic figures on the horizon, the first rough storylines saw a number of Time Lords restored to life including Morbius and the Master but with wave 2 postponed, the storyline was altered. Instead of including other Time Lords, I created a new one Daedelus who planned to resurrect the Time Lords. His plan brings him under attack from the Daleks. The story carried the umbrella title Return of the Time Lords while each individual episode had its own title. By the time episode one was about to air in July, part 2 had been shot and filming had started on part three. Parts four and five were still being written and my enthusiasm for the project was already starting to wane. At this point I realised that I was trying to do the kind of story that Russell T Davies would come up with. I decided to shelve the story from part three onwards and take it in a new direction. To create a story that only the AFT could do. The Time Lord character Daedelus and the Daleks were removed. Ingrid Fox was moved squarely centre stage but she needed an ally. None of the existing Who monsters fitted the bill. It was then I remembered the Sentienz and suddenly everything fell into place. And with it Torchwood went from being a nice nod-to-the-past inclusion to being integral to the plot. Parts one was filmed April 2009 with Part Two following in May. Part three began filming in July with the forest scenes on Daedelus' hidden world. The revised part three, along with parts four and five were shot in October with pick up shots for the 8th Doctor flashback done later that month. The use of a superior camera from September onwards means there is a marked improvement in quality from part two to part three. 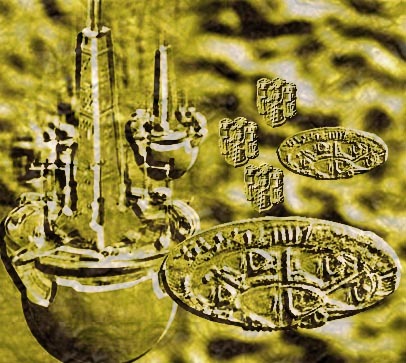 Among these shots are the model shots for the Mining Ship Antares and the Godmaker. 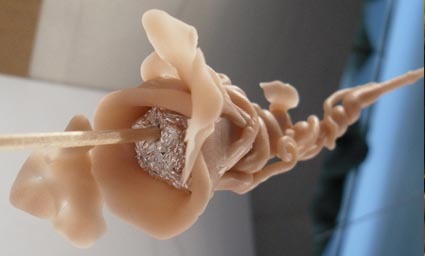 The Antares uses part of the SS Madame de Pompadour with the rest photoshopped away. 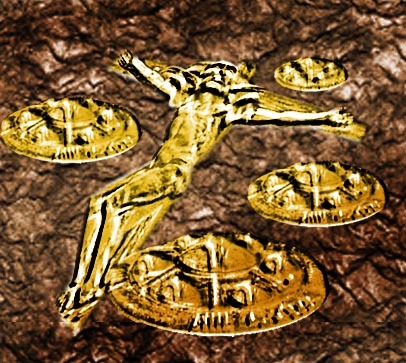 The Godmaker was a physical model made of super sculpy. 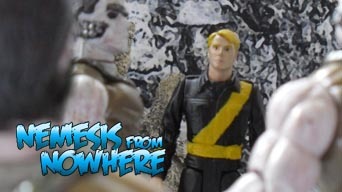 Episode one was edited ready for posting in July but with a change to a comic-book style for recent stories, part one had to be re-edited to bring it up to standard. The new edits were done in October and completed in November. A lot of the story required heavy special effects from filling in the roof of the cave on Crafe Tec Heydra, the revelation of the Sentienz's Tim e Lord battery and the scene where a Sentienz simultaniously ages and regresses Torchwood. 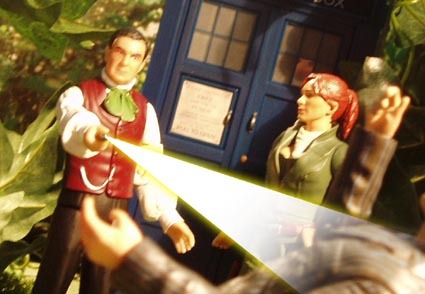 Back when this story was produced in 2009, we didn't even have a figure of the 8th Doctor so for the Time War flashback in episode four, I had to use my scrappy custom made figures. At the time I quite liked that we were literally seeing into a different era but things have moved on a bit both in terms of the toys and the Doctor Who mythology so I decided to go back and revisit the scene. The 50th Anniversary story The Day of the Doctor has established that it wasn't the 8th Doctor that was involved in the Time War but a hitherto unknown incarnation. Now in April 2014 we have a figure of the John Hurt Doctor so I decided to bring this scene up to date with the new Doctor plus my 5" version of Torchwood. I promise not to go all George Lucas on any other bits of the AFT. 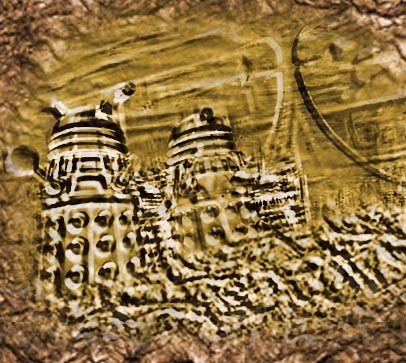 The planet of Crafe Tec Heydra is referred to in Russell T Davies' notes in the 2006 Doctor Who Annual page 21 where it talks about the carvings in the side of a mountain showing a war ending in fire and the depiction of a lone figure walking away with the legend- You Are Not Alone. I've taken a few artistic liberties with the details but the planet is intended to be the same. Even long term readers might be bemused by some of the backstories mentioned in GODMAKER as some of them haven't even been written yet. I've included the necessary information from them but essentially here's a run down of the two stories we haven't seen yet! After leaving Torchwood Cardiff in 1980 (Fox Hunt) Ingrid joins forces with the Ice Warriors and fights the 4th Doctor. (UPDATE! This story was written and published as White Christmas in 2010) Escaping at the end of that story, she returns in 1993 to battle another Doctor. Here she is finally captured as the Doctor discovers an alien virus in her DNA. She is put in prison, with temporal shielding to keep the virus at bay. After some years, she escapes back into space where she meets the Sentienz and hatches her plan for revenge. It is possible that Ingrid has survived. And the Cruciform being taken over by the Dalek Supreme as mentioned by the Master in The Sound of Drums. 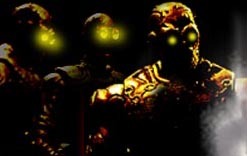 The Sentienz were created for the 8th Doctor finale, The Infinity Program so fitting that their return visit is another finale. That story establishes their history as Time Lord service robots that were outcast because they wanted the power of regeneration. It was always my intention that their true nature was so horrific but deliberately held it back for another story. For the record, this story takes place between Planet of the Dead and The Waters of Mars. Torchwood's final line "he will knock four times" is a reference to the return of the Master in the 10th Doctor's proper finale The End of Time a phrase first mysteriously used at the end of Planet of the Dead. Another portentous line aped in part three when one of the faux Time Lords tells the Doctor his "song of loneliness will be ending soon" a corruption of the Ood's warning in Planet of the Ood. I'd like to point out that beyond the trailers that have been shown and a photo of Timothy Dalton in costume, I know nothing about The End of Time. Any similarity between it and Godmaker is entirely down to great minds thinking alike or RTD nicking my ideas. Again.